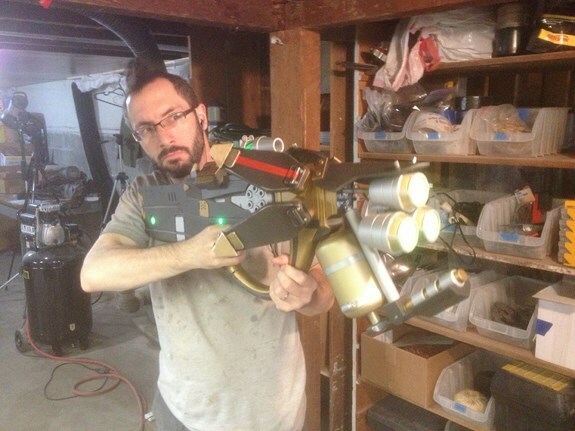 I was SO JAZZED when I got a commission for the Borderlands 2 Hyperion Plasma caster! 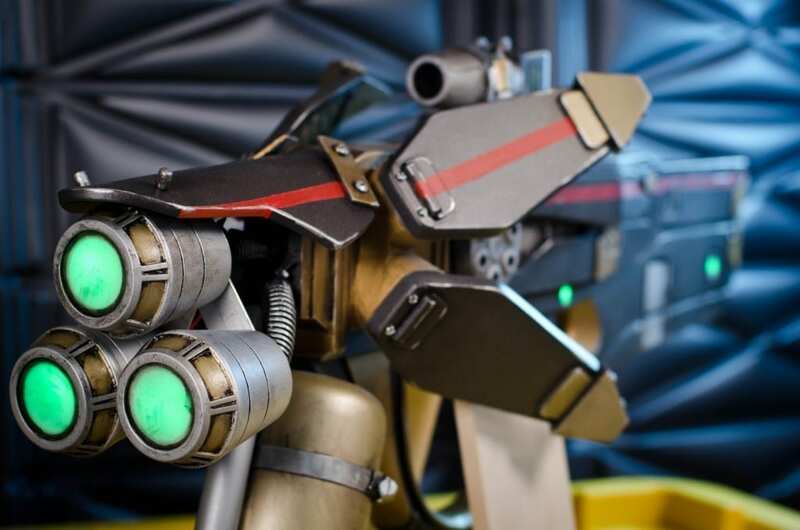 I’ve been looking forward to doing some Borderlands weapons and this one was a doozy! Since this was a commission for Dragon Con 2013, I had a hard deadline and knew that I wouldn’t have time to make a full mold of this guy. I did, however, need to make a couple of smaller molds for some of the repeated pieces like the barrels and side wing-a-lings. For starters, like usual, I drew up a full scale blueprint in Inkscape, based on the in-game art. This has to be the most detailed blueprint that I’ve drawn to date. 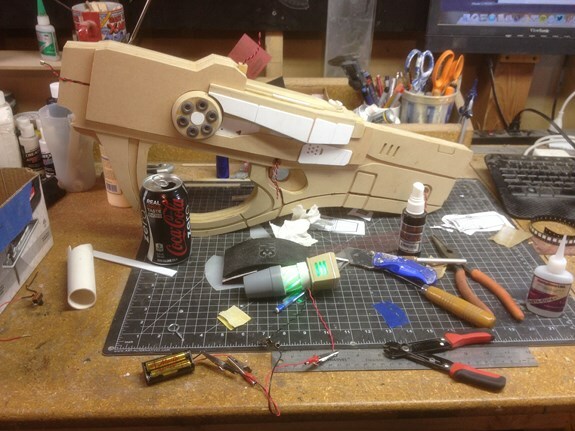 The Plasma Caster is COMPLEX. 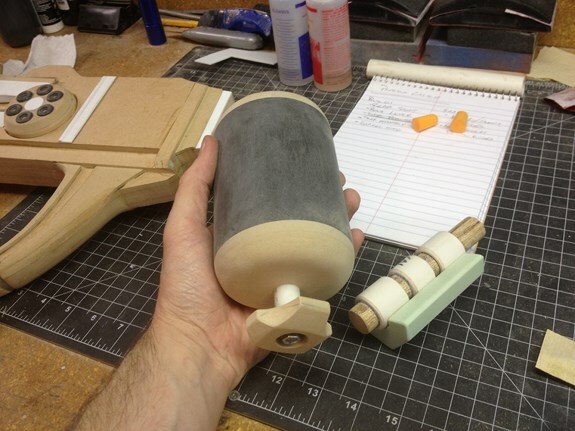 The barrels were made from lathed pieces of spare polyurethane plastic (detailed video here). 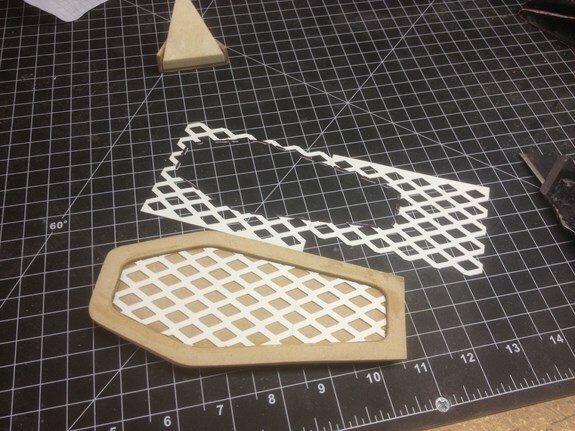 I cut in all of the details then added the horizontal lines from pieces of 1/16″ styrene. When the barrel master was all finished up, I molded it in silicone and made a bunch of copies in polyurethane plastic resin! 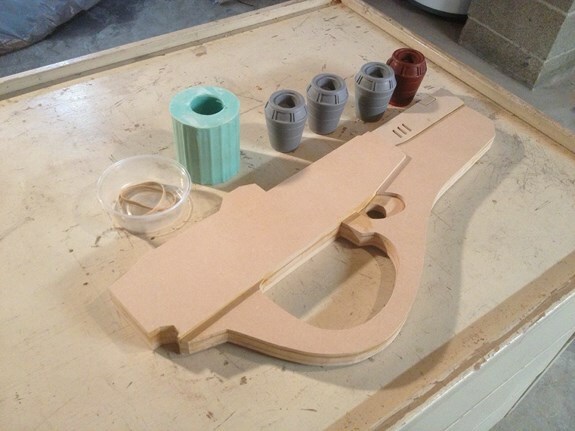 The wings also needed to be molded, so the were made separate from the gun body. 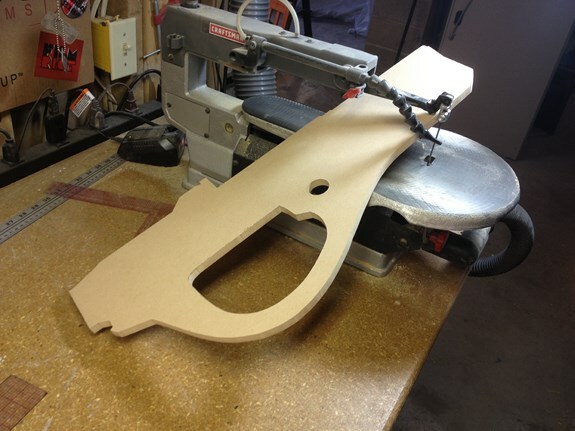 Most of the shape was cut from various thicknesses of MDF on my scroll saw. 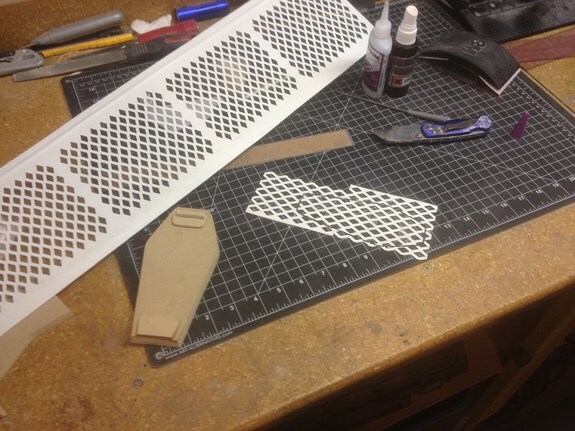 The grid on the inside of the wing was some kind of vent cover that I found at the hardware store and cut to shape. 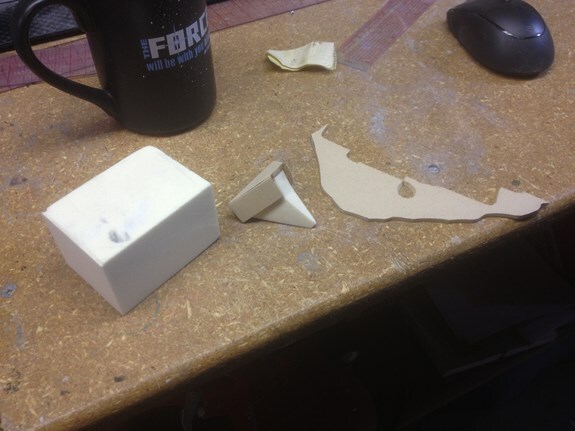 The goofy pyramid shape thing on the end of the wing was cut from a dense tooling foam. This is my first time that I’ve tried using it and I was pretty impressed. I ended up sealing it with super glue and it held a shape very well! 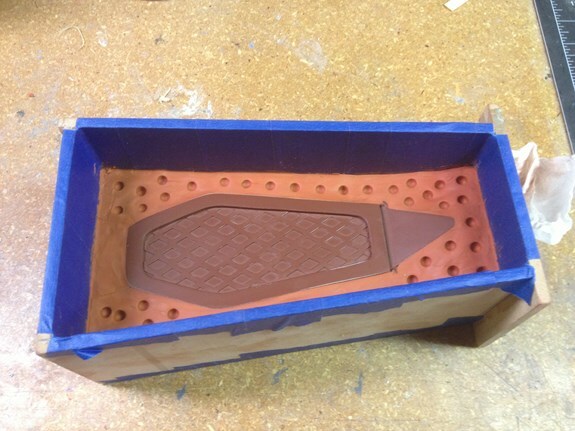 With all of the pieces shaped out and epoxied together, the wing was primed, sanded, and clayed up for molding! 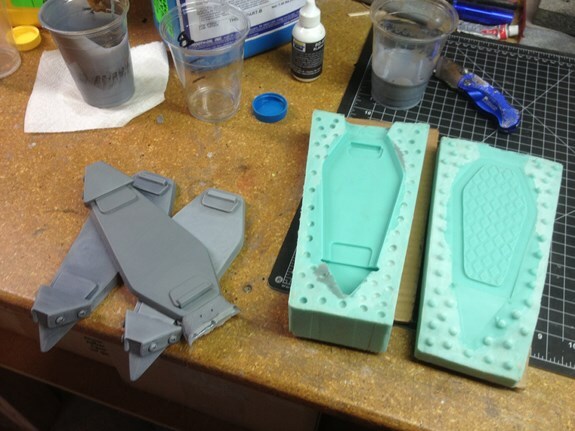 These pieces were also cast from a polyurethane plastic resin. 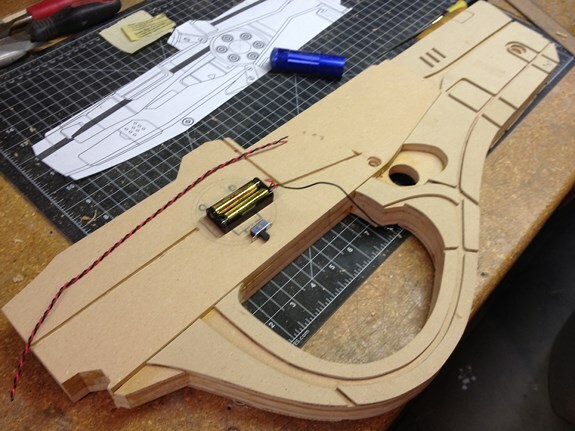 The main body of the gun was made mostly from various thickness layers of MDF wood. This is the “slicing” process that I’ve employed many times and you can see a detailed video of it here. 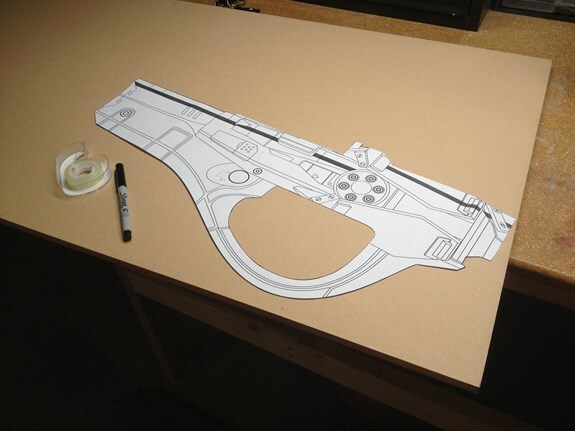 Basically, I trace out parts from the blueprint, cut them out on my scroll saw, and wood glue them together. 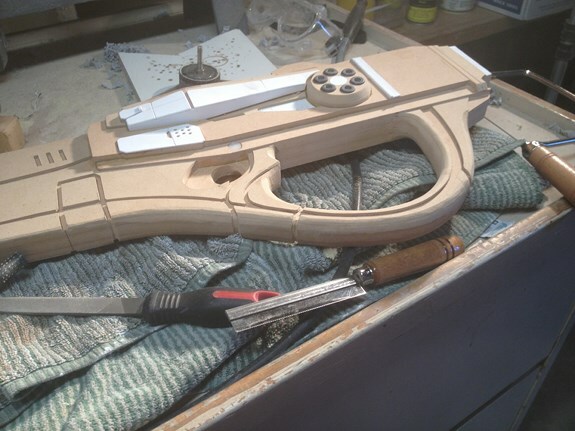 Most of the thinner detail pieces were cut from 1/16″ styrene plastic and super glued (smaller pieces) or epoxied (larger pieces) into place. 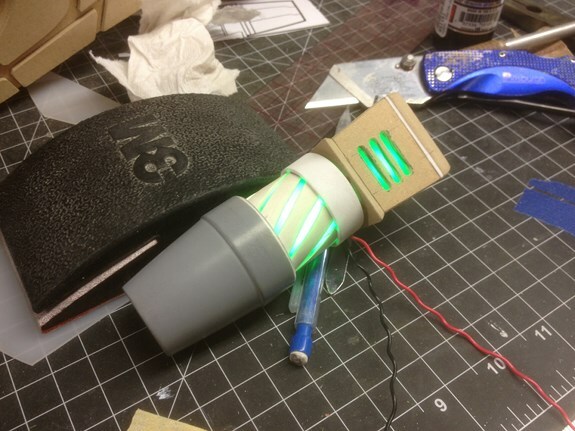 This gun has a bunch of lights on it, so I needed to run wires and make a battery compartment before some of the layers were glued in place. There are some large, circular pieces on either side of the gun. I cut each from MDF and put magnets on one of them to cover the battery on one side. Things were starting to get pretty serious at this point! I made a scope from some PVC pipe, MDF, and another lathed piece of plastic. This little guy got green LEDs put into it, because scopes should light up, right?! Right about this time I also ran into this sucker. 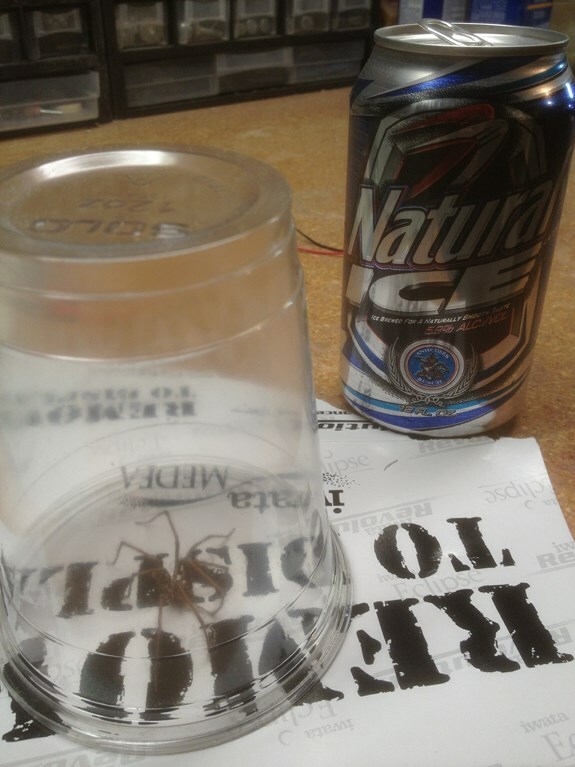 Not really something you want to see at 3am during a pre-con rush (beer can for size reference). 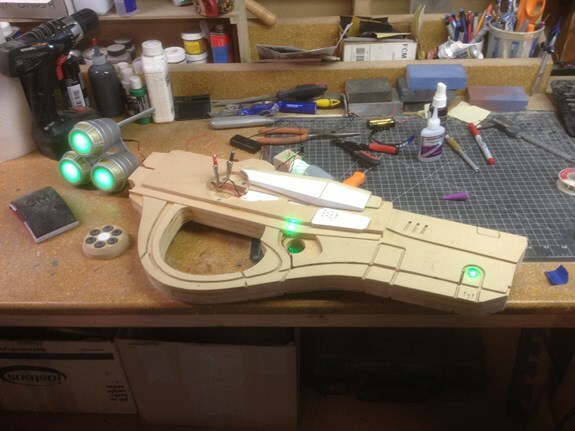 Here’s most of the gun body detail, the barrels painted, and all of the lights wired up for a test. At this point I was overjoyed that it all worked! 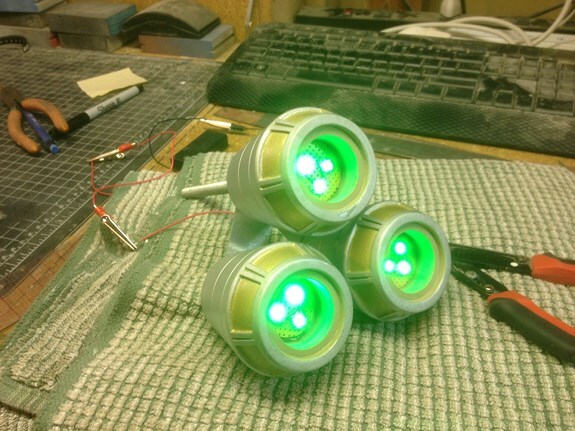 The lights inside the barrels were 3 green surface mount LEDs per barrel. The back side of the barrels were attached with some aluminum plates that I cut and bolted down with some burly steel threaded rods. 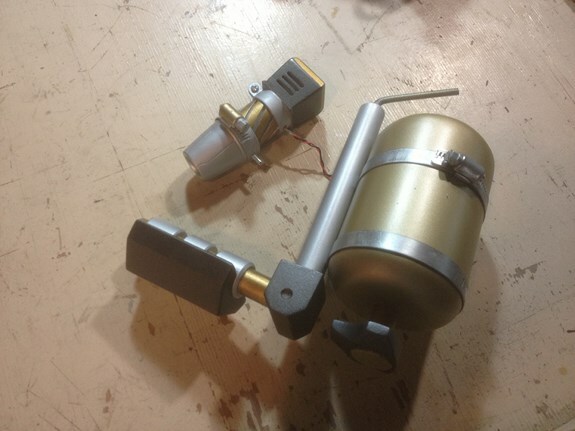 The larger, longer rod was designed to attach to the body of the gun and have the other two dangle below it. Then there’s this goofy thing. What does an energy weapon need a tank like this for?! Either way, I made it from a 3/5″ PVC pipe with a couple of MDF end pucks. 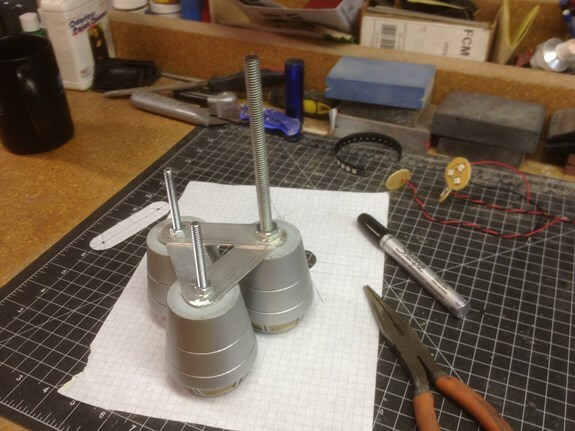 The pucks are glued on, but also have a threaded rod running between them to keep them cinched down to the pipe. 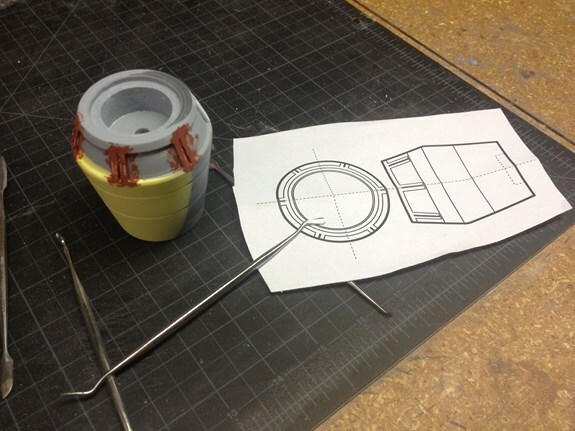 The poking out bit below the tank was made from dowel, PVC pipe, and more of that dense tooling foam. To get a nice, rounded shape on the lower handle I employed some new air tools that I picked up including a rotary tool with a rasp bit and a 3/8″ belt sander. 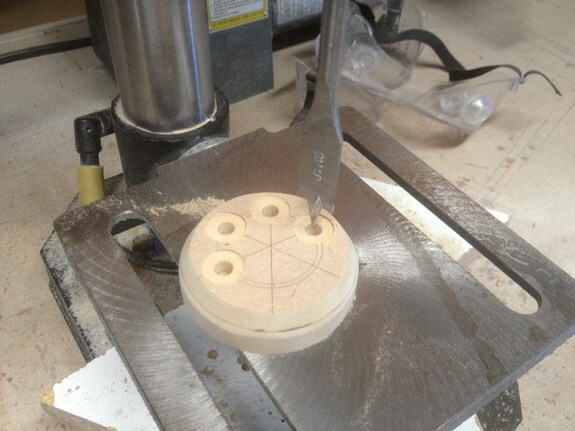 I also used a small saw and a file to carve in the lines around the edges. 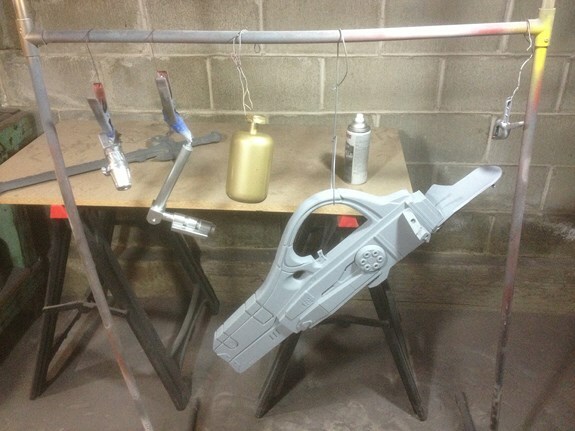 With all of the parts assembled, it was time for LOTS of filler primer and sanding. 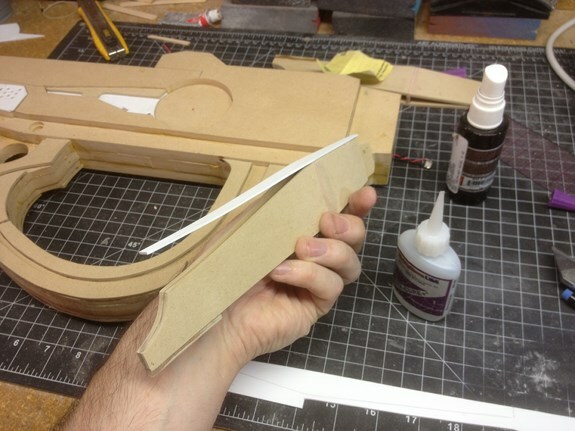 Most of the rough edges of MDF needed a lot of TLC to get them smooth enough for paint. 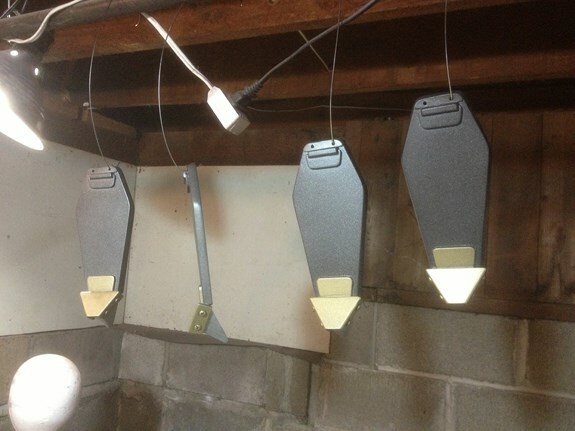 I made the individual wing pieces so that they could be detached for transport. 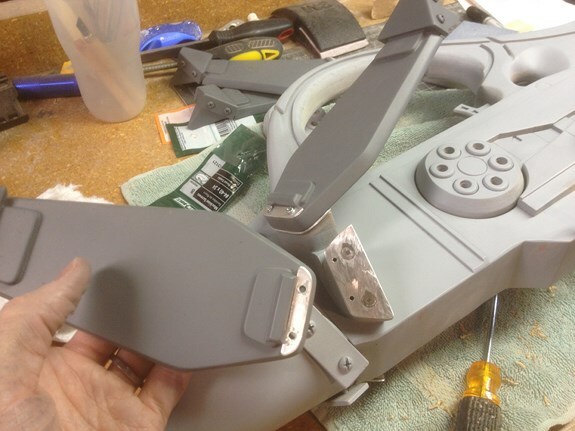 I added pieces of aluminum to the castings and the body of the gun so that the machine screws would have something solid to hang on to. Then I painted the whole thing. 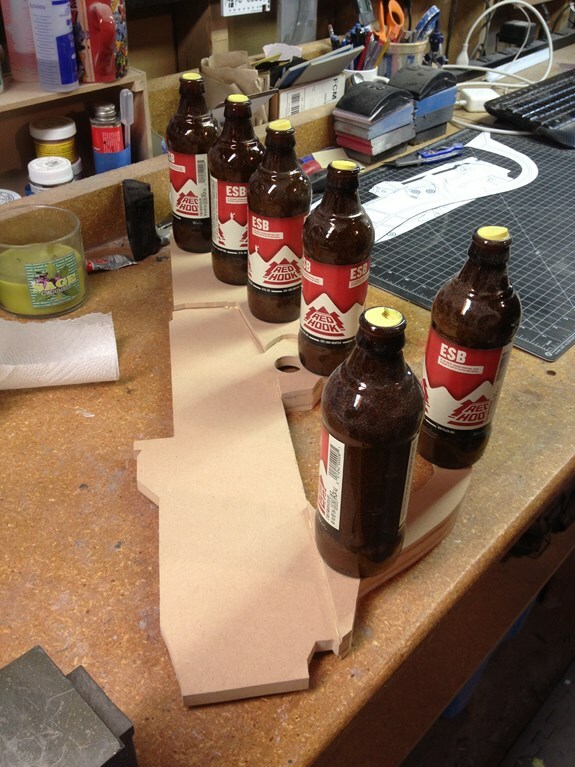 Sorry I don’t have more photos of this process, but I was getting close to the deadline and things got crazy. Essentially, I gave everything a base coat of dark metallic paint from a rattle can, then brushed the gold and silver bits with acrylic paint. 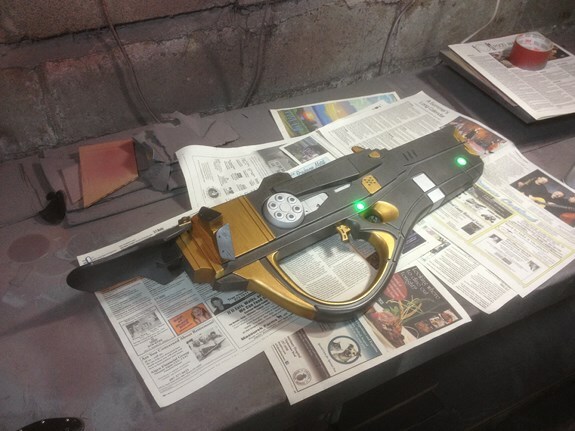 A little weathering with black acrylic paint and we’re done! Booyah!